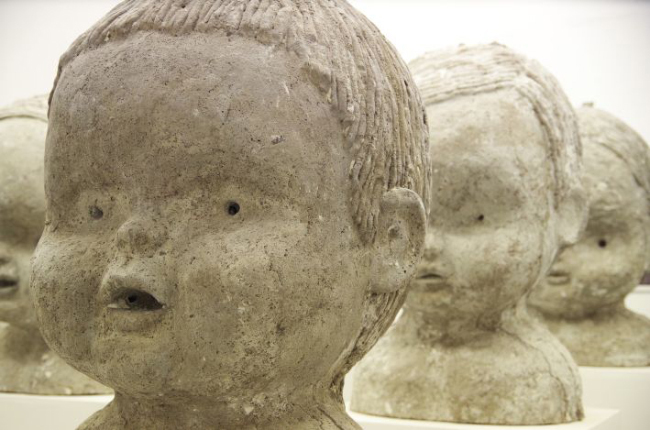 The solo exhibition The Square of Dolls, by Estonian sculptor and 2014 Köler Prize winner, Jass Kaselaan (b.1981), will be held in the Creative Studio of the Arsenāls Exhibition Hall of the Latvian National Museum of Art in Riga. In speaking with Härm about the upcoming Riga exhibition of the Köler Prize-winner, it was important to Arterritory.com to find out if Köler Prize nominees are capable of only competing against one another, or if they also have the ability to rise above themselves and create their own rules of the game. Härm answered: “I believe it is the latter. All the winners of the Köler Prize have been able to present ‘their journey’ at the exhibition, to express how this particular step in their oeuvre (the obligation to exhibit one earlier piece from the last 3 years) has been transformed into something more mature/profound/different in the new work that has been made specially for the Prize exhibition. Twice out of four possible times, the People's Choice Award and the main Prize have gone to the same artist; the other two times it came very close to both awards going to the same artist. As we can see, the artists who have won convinced both the audience, i.e., regular exhibition goers, and the very professional jury members at the same time. Shortly before the opening of the exhibition, Arterritory.com contacted Jass Kaselaan himself, to find out some more about the exhibition and his creative working process. Art critics have described your represented generation as monumental sculptors who lack the ambition to create monuments. And again – your works in The Square of Dolls exhibition evoke associations with monuments. How would you describe your relationship with the monument as a medium? I have no exact definition for the word “monument” – I do not know what that word, “monument”, actually means. In today’s world, it is a rather unclear term. Every item or every move you make... can be seen as a monument to something. I haven’t created any traditional monuments – a statue of an important man in bronze, on a pedestal in the cityscape – or something similar to that. However, I can say that I do like traditional monuments – they represent the time and the situation in which they were made. Your project The Square of Dolls is a spatial installation made up of monumental concrete busts of broken dolls, found near the trash bins of a block of suburban high-rise buildings. Could you please reveal its emotional and philosophical message? I am afraid that’s not possible. If I could put the message into a short, literal form, I would have made a poster, for example, instead of a sculptural installation. I hope that the audience finds a message for themselves. What does this project say about materiality and form? I hope – quite nothing; materiality and/or form are not central in this piece. You surround your sculptural objects with different kind of mediums, like in The Square of Dolls, you use photography. Isn’t sculpture, as a medium, self-sufficient for you? In my installations, I have used and put together many different kinds of mediums – photos, prints, video, sound and so on. The fact that I work with sculpture does not mean that an installation should only be in a three-dimensional form. In my installations, I use what I think feels right and necessary. It is quite popular to insert art into the everyday environment. But your works often dominate the volume of an exhibition room. Why do you still prefer traditional exhibition spaces? The way I see it, an exhibition room gives greater freedom than the so-called everyday environment. In a traditional exhibition space, I like that there is a quite fixed format, a specific space to play with. You represent a new generation of Estonian sculptors. And the chairman of the Köler Prize jury, Anders Härm, stated that your work proves how vital a medium of contemporary art the works of the new generation of artists are. What, then, is your relationship to the canon of work done by Estonia's old masters? My relationship with the old Estonian master sculptors is strong. When I make my pieces, I use quite traditional methods, which I have learned from so-called old-school masters – methods that most Estonian contemporary artists do not know, or have decided not to use.